On arrival, you will be met and transferred to hotel by the local guide. After a good rest in a comfortable hotel TVH recommended, you will take dinner at an Indian Restaurant. Overnight at the hotel. Depart from hotel in the morning to visit the biggest public square in the world, Tian’anmen Squareconquers you with its grandeur at the first sight. Then you are leaded to Forbidden City. It is the imperial palace for 24 emperors during Ming and Qing Dynasties and the biggest ancient architecture complex in the world. You walk in the museum to see with your eyes, to touch with your hands and fell with your hearts. In the afternoon, you continue your trip to Summer Palace. Having the largest royal park and being well preserved, it was designated, in 1960 by the State Council, as a Key Cultural Relics Protection Site of China. Containing examples of the ancient arts, it also has graceful landscapes and magnificent constructions. Dinner at Indian restaurant. Over night at hotel. In the morning drive 75km to visit the Jade factory and Great Wall at Juyong pass which is the symbol of China and the wisdom of Chinese people. It is very unbelievable that Chinese succeeded in building such a great architecture with simple tools in ancient time. You will have a short stop and take photos in Beijing Olympic Park, where you can see the outside view of the National Stadium-- Bird’s Nest and National Aquatics Center --Water Cube. Tea house will be followed after the sighseeing. In the morning, you will visit the Liulichang which is a famous district in 2/19 down-town Beijing that is known for a series of traditional Chinese stone dwellings housing that sells various craftwork, artistry, and antiques. It is one of Beijing's traditional old quarters. Then visit Da Shi Lan, one of Beijing's most famous old-fashioned streets, has a history dating back 570 years. It was built in 1430, the 18th year of Emperor Yong Le's rule during the Ming Dynasty. Da Shi Lan is 375 meters long and is home to 26 shops from nine types of trade. 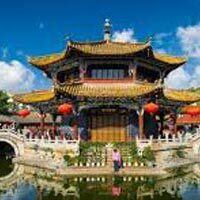 Morning take flight/Super Fast train to Shanghai, on arrival, met and visit a Buddhism shrine – Jade Buddha Temple, located in a crowd of Shanghai City. It is named for its two bejeweled white jade Buddha. Carved from a whole piece of white jade, the sitting jade Buddha statue is translucent with a solemn expression, displaying the excellent skill and extraordinary art of Chinese people. Yuyuan Garden has many scenic courtyards decorated with baroque rockery, pools, and flora that are all connected by corridors and passageways. Then you will visit pearl factory and the shopping trip will begin in Nanjing Road which is starts at the Bund and runs westward, with People's Square in the middle. Renown for its bustling and modernization, Nanjing Road earns its reputation as the 'First Commercial Road in China', which is the good shopping heaven for your trip as the same as the Fifth Avenue in New York and Avenue des Champs-Elysées in Paris. Some of the traditional food and handicrafts of Shanghai can be found here. Then we come to the Bund, The renowned waterfront district is the city's most famous landmark. The word BUND is of Anglo-India origin meaning embankment on the waterfront. It is also the popular site to enjoy the night view of the city. Today you will visit Zhujiajiao, Located in a suburb of Shanghai city, Zhujiajiao is an ancient water town well-known throughout the country, with a history of more than 1700 years. Covering an area of 47 square kilometers, the little fan-shaped town glimmers like a bright pearl in the landscape of lakes and mountains. Endowed with another elegant name -'Pearl Stream' - the little town is the best-preserved among the four ancient towns in Shanghai. After a wonderful trip today, you drive back to Shanghai and take Indian dinner at Indian restaurant. Breakfast at the hotel. Get transferred to the airport for Final Departure. Package exclusion: Airport tax and gratuities, China visa, Travel insurance, excess baggage charges, Personal expenses and in & out, China international airfare.